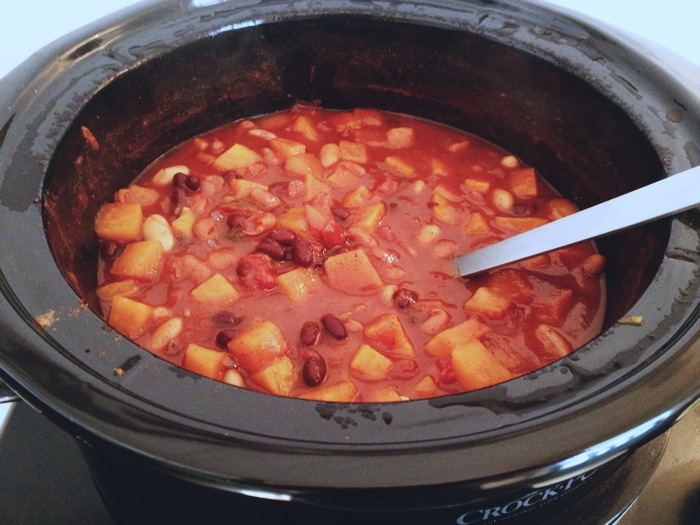 While it’s snowing, I’m cozy in my living room, sharing my new Crock-Pot Sweet Potato Chili recipe. How appropriate! Now, I know…chili is a meal that scares some people. And for good reason… there’s even a song about beans being a musical fruit. I get it. BUT I have a solution that my mother taught me. The beans are not the problem. It’s the bean juice. Ew…that even sounds gross. The fancy thing about Crock-Pots is you can throw it all in, go to work, and when you arrive home, it’s ready. What a revolutionary idea. Saute your garlic and onion in a frying pan. Then add everything into crock pot. Stir it and set Crock-Pot on LOW for 7 hours, or on HIGH for 4. EASY PEASY. Serve, sprinkled with chopped scallions and/or cheddar cheese. Up to you! While the Crock-Pot did it’s finest work, I baked these yeasty-doughy-dinner rolls. I used whole wheat flour. And the aroma was heavenly. And I thank Pinterest for them. And I ate another one at midnight. Sshhh..
thank you Ev, you are so sweet :) I gotta check yours out!